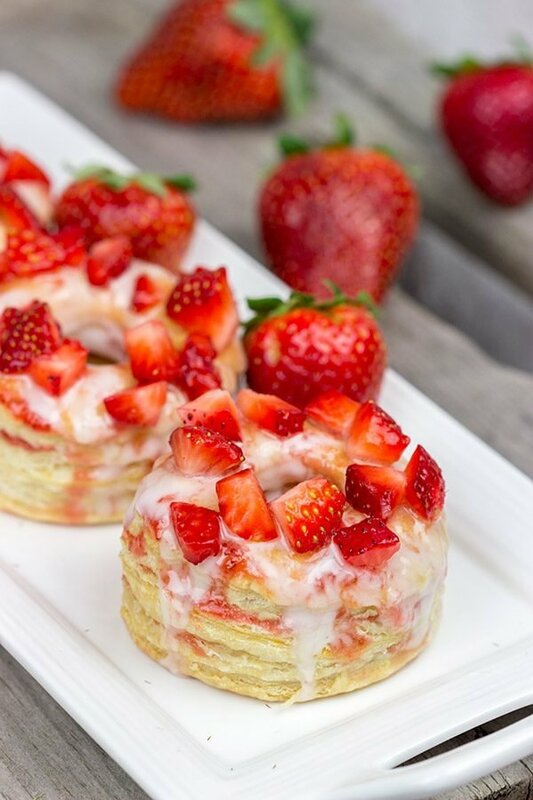 Featuring layers upon layers of flaky goodness, these Strawberry Puff Pastry Donuts are a tasty way to celebrate fresh summer strawberries! Do you remember the Cronut Craze of 2013? I do. I remember hearing about it on the Saturday morning news…mainly because this croissant-donut combo had become an overnight superstar in NYC. Seriously. Within just 3 days of introducing the cronut, the Dominique Ansel Bakery had lines of 100+ people outside waiting to get a cronut. I heard stories of people waiting for 4+ hours to get cronuts. Ok, I love a good pastry, but I’m not sure I’m willing to wait 4 hours to get one. Seriously. Think of all the things you can do in 4 hours! Waiting in line for a cronut is pretty low on that list. I happened to be down in NYC in the Spring of 2014, and I noticed that Dominique Ansel’s bakery was right around the corner from my hotel. After a bit of googling, I discovered that the line was a lot shorter than before…only 2+ hours now to get a cronut! Needless to say, I didn’t get a cronut. For the record, I have still never had an authentic cronut. I’ve talked to friends who have, and they offer high praises. (Although they also say that they wouldn’t wait in line again.) Dominique Ansel later released his recipe for the famed pastry, and I’ve been tempted to make them here at home. But they take 3 days to make! 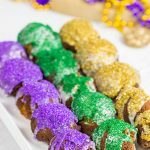 Good Morning America rates the difficulty of the recipe as “Extreme.” I love a good challenge in the kitchen, but even I am afraid of the big, bad wolf cronut. 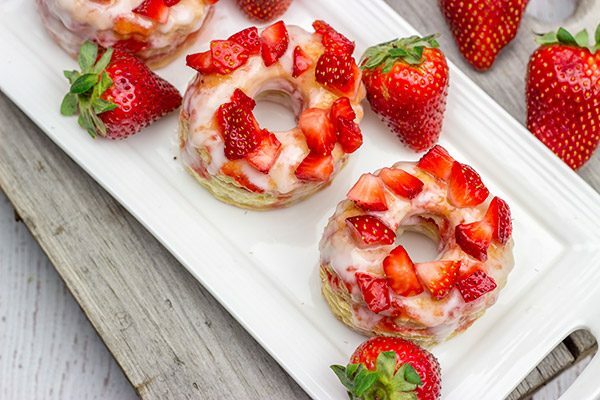 I stumbled across the concept for these Strawberry Puff Pastry Donuts while flipping through an old issue of Food Network magazine. I was immediately intrigued by the idea of using puff pastry to create donuts. I had to give it a shot! And I must say that these Strawberry Puff Pastry Donuts turned out quite well. They still took a bit of time to make, but it’s far less than the 3 days of prep time needed to make cronuts. 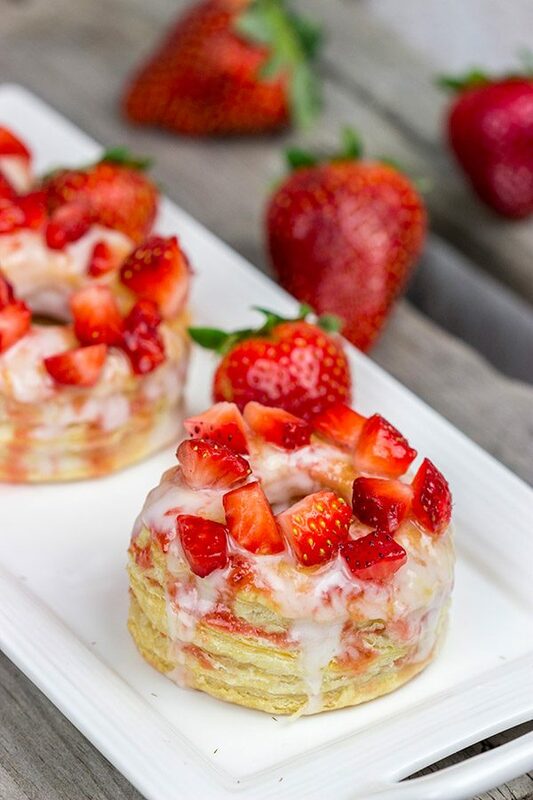 As I’ve never actually had a cronut, I can’t offer any comparisons here, but I can say that these Strawberry Puff Pastry Donuts are delicious! I used fresh strawberries and strawberry jam, but almost any combination of fruit and jam would work. I love using puff pastry for all sorts of recipes, but this is the first time I’ve used puff pastry for donuts. Woah! This will definitely not be the last time I use puff pastry for donuts. It turns out that flaky layers upon flaky layers are a great base for a donut. Dominique Ansel was onto something with that cronut idea. 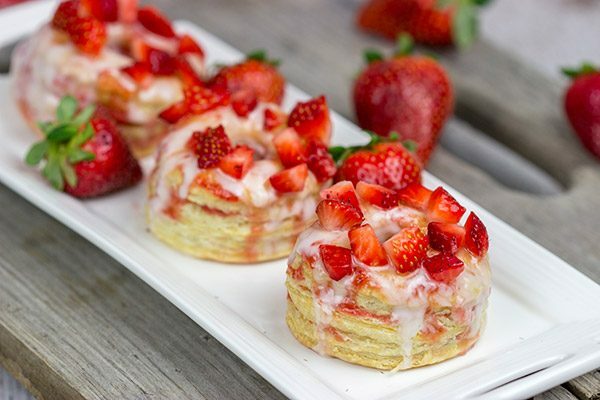 Grab some fresh strawberries and make a batch of these Strawberry Puff Pastry Donuts soon! What is the longest you’ve ever waited in line for something? And was it worth it? 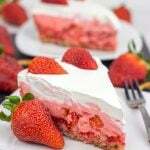 Looking for more fun strawberry recipes? Check these out! Using a small saucepan, add all filling ingredients (strawberries, jam and water). Place over medium heat and cook, stirring occasionally, for 10 minutes. 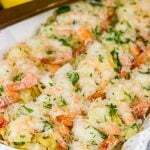 Refrigerate filling until cold (at least 1 hour). Line a baking sheet with parchment paper; set pan aside. Working on a lightly-floured surface, unroll one sheet of puff pastry and brush entire top of sheet with beaten egg. Unroll second sheet of puff pastry and press on top of the first sheet. Place puff pastry rounds on prepared baking sheet; bake at 400°F for 22-25 minutes, or until lightly browned. Once doughnuts have cooled, slice each one horizontally into 3 layers. Brush cooled filling mixture on top of bottom layer. 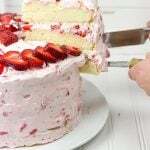 Add second and third layers, brushing each layer with more filling. Using a small mixing bowl, whisk together the powdered sugar, vanilla and milk until smooth. Drizzle glaze around tops of the doughnuts. 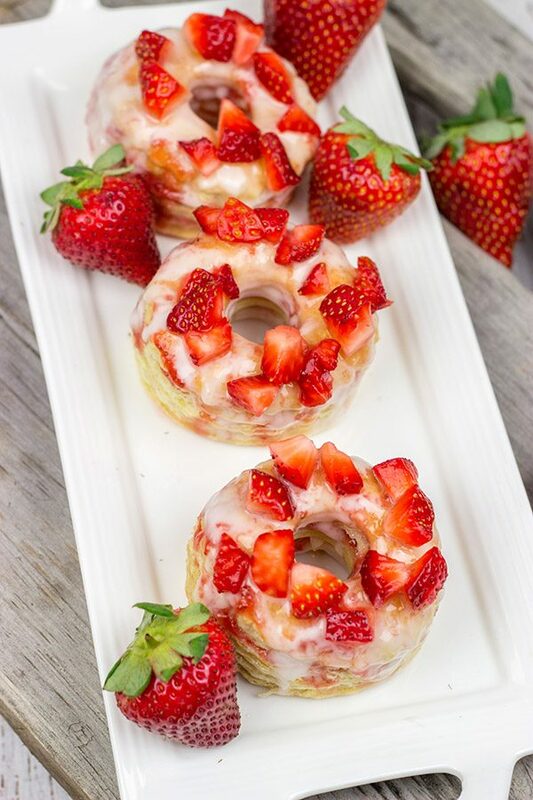 While still wet, sprinkle diced strawberries on top of the glazed doughnuts. Let glaze set (~15 minutes) before serving. Idea adapted from Food Network. Yeah, I’m sure the cronut is delicious but I wait in line for no pastry. I love the idea of using puff pastry to make donuts, though! Puff pastry is one of those things I always have in my freezer for dessert emergencies so I have everything I need to make a batch of these for breakfast. I’m not sure if I should thank you or not :). Happy Fourth, David! I’m with ya, Kelsie. The cronut might be awesome, but I’m not a wait-in-line-forever kinda guy. Plus, I just love to bake at home, so there’s always plenty of tasty dessert options around our place. And you’re totally right about puff pastry being the solution for dessert emergencies. Happy 4th to you, too, my friend! Hopefully it’s not too hot out there in your area! I have had a cronut, and I have to tell you, they’re incredibly good. But I agree, I would not wait in line for one for 2 hours. Especially if I could make something as delicious as this puffed pastry baby you’ve got here! It looks fantastic I’ve never had anything made with puff pastry that I didn’t love. You’ve had a cronut? Like the real deal Holyfield cronut? I’m intrigued, Jeff! I would say jealous…but I’m not sure that’s the right word. I am curious, though. But not 2-hours-in-line curious. Puff pastry really does solve a lot of problems when it comes to making desserts…so tasty! Thanks so much, my friend! Absolutely gorgeous!! I’m not sure how you actually bite into that creation – but I can’t wait to try! Happy July 4th! Thank you so much, Yael! I really appreciate the kind words. 🙂 I’m not exactly sure how you bite into it either…so I say do it quickly, and then grab another one! 🙂 I appreciate you leaving a comment! Hi David! 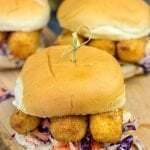 These sound and look absolutely delightful! I could see using raspberries or blackberries too. I personally would not wait in line for even an hour for anything. Like many people I always have puff pastry in the freezer, it just comes in so handy for last minute desserts. Have a wonderful 4th of July feast! David, I’ve never tried an authentic cronut either. Indeed, I’ve never tried a cronut at all. And what? Staying 2-4 hours in line? No thanks. If there’s waiting time more than 20 min to be seated in the restaurant, we always leave. And that’s a restaurant – not a bakery. I love this version. I think puff pastry is a great way to enjoy donuts in summer as it’s lighter (Talking only about texture, not the calories) and airy. And topped with strawberries? Perfection. Happy July 4th! Yeah, I hear ya, Ben. Waiting 2-4 hours in line for a cronut is pretty far down on my list of things I want to do. I don’t mind waiting when we go out to eat because we can just go grab a drink at the bar. But standing on a city sidewalk for 2-4 hours? Nope. Plus, I just like to bake at home too much anyways! Thanks so much, my friend. I hope you had a good Canada Day recently! I’ve never had a cronut either! I agree that 4 hours is a LONG (too long!) wait for one haha there’s a gourmet ice cream place that recently opened in San Diego, and the lines are routinely out the door. I waited on it for 30-45 minutes… and it was totally worth it! 30-45 minutes for ice cream? I would’ve been skeptical about that, but if you’re saying it’s worth it…then it’s worth it. 🙂 Thanks so much, Nicole. Hope you guys had a great 4th! I have never had a cronut before. I am sure that I would not wait in line for 4 hours to try one. 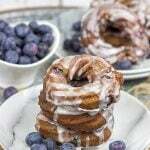 I would like to try one of these puff pastry donuts they look amazing!! I am not good at waiting in lines. So using puff pastry to make these donuts was a really fun twist! And I agree with you about waiting in lines…that’s not high on my list, either, Dawn. Thanks so much, my friend! Love how versatile puff pastry is – what a fun idea to make donuts with it. They look like the perfect summer treat with the strawberries and a great alternative to the 3-day recipe. Never had a cronut either but now I am intrigued – would love to try a cronut one day too (without the 4 hour queue) :-). Have a wonderful weekend ahead, David! 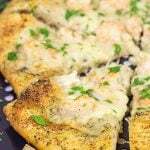 Puff pastry really is super versatile! It can be used just as easily for sweet and savory dishes, too. So I have to say that puff pastry donuts was a fun twist! And it made the baking process so much easier than waiting 3 days. I mean I enjoy a good baking project, but 3 days is kinda crazy! Thanks so much, Miriam! I’m with ya, Kathy! 10 minutes might even be too much for me…haha. I get too impatient. But baking a version at home with puff pastry? I’m all about that! Thanks so much, my friend! This is just pure genius, David! Definitely making these this summer! Haha…thank you so much, Marissa! I have to say puff pastry really is a fun way to put a twist on a dessert. These donuts are super flaky and super tasty. Hope you had a great 4th, my friend! Funny thing, the strawberries have more or less disappeared from our farmers’ market around here, replaced by peaches and cherries. Too bad, because this looks so very good! David, Lil Shashi and I happened to stand in one of those lines to get cronuts when we visited NYC a couple of summers ago – but, the line wasn’t too long (of course, we got there at the crack of dawn – half dressed in PJs) – and we met the cronut lady who had eaten just about every cronut flava made and who had cronuts at her wedding – AND, the Dominique Ansel bakery folks served us samples of coffee and madeleines while we waited for the store to open! Buuuuut NYC and those cronuts are a long way from Athens and besides – with these beauts, I find myself wondering what cronuts?! 🙂 Love the puff pastry usage in these! Wow, they served samples and coffee before the store even opened? That’s certainly nice of them! I’m still not sure I’d roll out of bed that early for a cronut, but the coffee is a tempting offer. 🙂 Puff pastry is such a versatile ingredient, and I love using it for making pastries…and now donuts, too! Thanks so much, Shashi!